The skin protection cream Protect X1 and S1 has five effects to prevent three skin troubles; Protect UV+ has six effects to prevent four skin troubles. Prevention of rough dry hand...Apply before working to prevent hand from sterilizer and detergent stimulations. 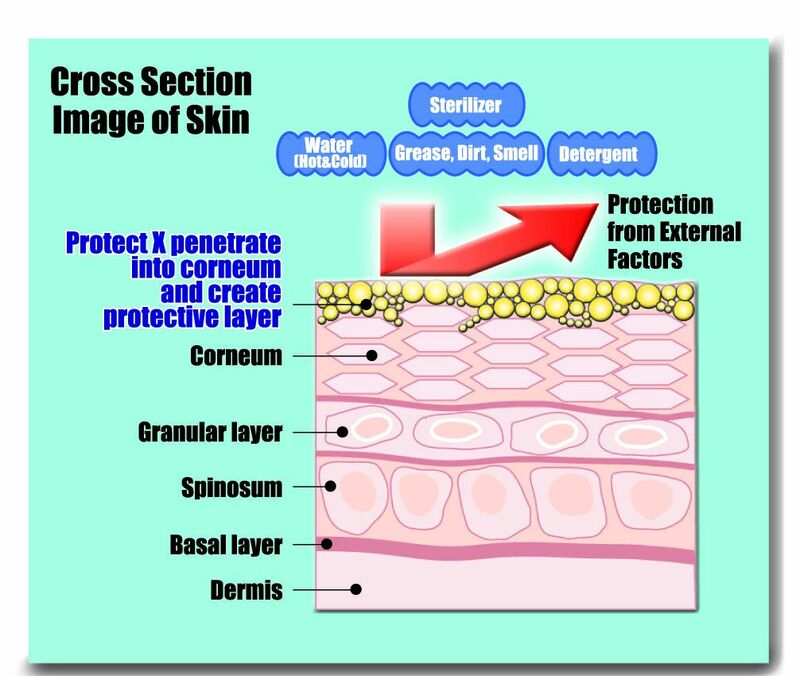 Suppression of penetration...Suppressing the penetration of bacteria to the skin to supplementarily prevent infection. Infiltration prevention...Making hard to infiltrate dirt and smell into the skin, complementing washing with soap. Secondary prevention...Apply before putting gloves/masks on to prevent from adhesion/dispersal of stimulants. Scratch prevention...Preventing from scratches caused with clothes, shoes during sports activities. UV protection...For protection of skin troubles caused by Ultra violet A and B rays. Four skin troubles are as follows. Rough dry skin (especially rough hand). 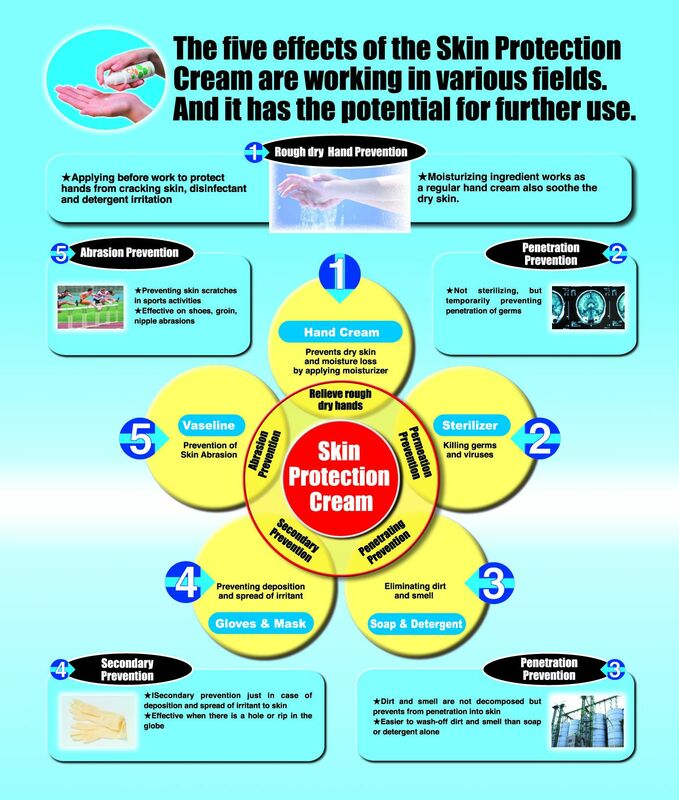 Our skin cream Protect Series strongly prevents your skin from trouble with its total power by partially complementing the effects of 1: hand cream, 2: pasteurizer, 3: hand soap, 4: gloves/mask, 5: petro gel, 6: UV protector etc. The most significant feature of the Protect Series is the prevention of skin trouble by applying it beforehand. The effect last for 3 ~ 4 hours; few applications per day is just sufficient. There is no smell or oily residue; many users are satisfied with the result and effects. The Protect Series has very large share of the market in medical, industrial, maintenance, food, agricultural fields, and also military in Japan. It is also popular amongst athletes and at home, too.